17 Dec 2018 --- Cargill has outlined its plan to eliminate deforestation from its cocoa supply chain through the company’s Protect Our Planet plan, which seeks to provide concrete actions to achieve 100 percent cocoa bean traceability. The plan also includes a commitment of “no further conversion” of any forest land in Ghana and Ivory Coast for cocoa production, and expands the company’s forest efforts to five origin countries (Brazil, Indonesia, Cameroon, Ivory Coast and Ghana). 1. 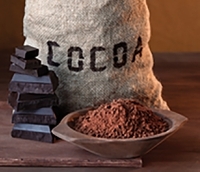 Supply Chain Transparency: Cargill intends to achieve 100 percent cocoa bean traceability. The company will map its entire cocoa supply chain, using GPS and polygon farm mapping globally, to identify the exact location of the farms and accurately assess farm size. The company will also continue to introduce traceability technology to cooperatives and farmers such as a Coop Management System (CMS) and bar-coding of bags enabling the company to trace beans back to individual farms. Cargill has already achieved 100 percent traceability from farm to factory in Ghana using these technologies. The company is aiming to achieve the same in Ivory Coast in 2020, where it mapped over 80,000 of the 120,000 farms in its direct supply chain. 2. Cargill Cocoa Promise: Cargill is integrating environmental protection projects into its Cocoa Promise program. This includes expanding existing programs related to growing more cocoa on less land, economics and labor issues to include agroforestry and conservation. 3. Supplier Engagement: The company is committed to managing the risk of deforestation not only in the Cargill Cocoa Promise supply chain but also within indirect cocoa and chocolate ingredient supply chains. This includes raising standards for third-party suppliers to advance their own transparency and build their capacity to address common challenges. 4. Transformation, Together: The journey towards sustainable business practices is far greater than the actions or interests of any one company. Last year, Cargill co-signed the Cocoa & Forests Initiative (CFI) alongside thirty-four other chocolate and cocoa companies, the World Cocoa Foundation and the IDH Sustainable Trade Initiative to achieve a fair and secure cocoa supply chain. Protect Our Planet also includes collaborative arrangements with (sub)national & landscapes initiatives and support of stronger legal enforcement mechanisms. 5. Reporting & Sharing: Cargill has committed to reporting annually to all its stakeholders, including customers, CFI, NGOs and others. By sharing progress and learnings with stakeholders around the globe, participants in the cocoa supply chain and beyond can learn from each other on this journey to end deforestation. Earlier this month, Cargill Cocoa & Chocolate commemorated its 10th anniversary in Ghana by announcing plans for future investment and farmer support. 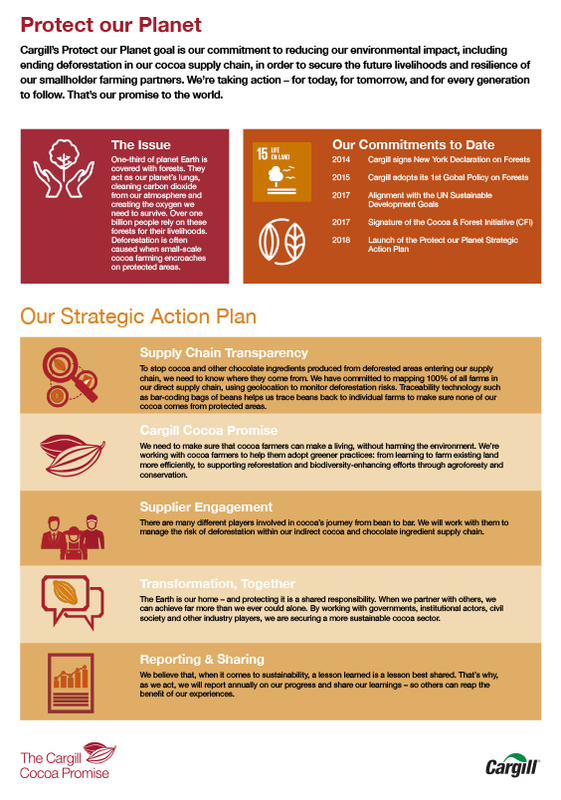 The initiatives are informed by the principles underpinning the Cargill Cocoa Promise – the company’s commitment to improving the livelihoods of farmers and communities. Cargill's ambition is to secure a “thriving cocoa sector for generations to come,” says the company.